László Nemes’ debut feature seemingly came out of nowhere to win this year’s Grand Prix (effectively the silver medal behind the Palme d’Or), but it’s certainly a worthy runner-up . . . Shot in a series of long takes, Nemes’ holocaust drama follows death camp worker, Saul, on his search for a rabbi to give his son a honourable burial. And, credit to the creative team for remaining fiercely loyal to their protagonist, because there must have been the urge to drift from the titular lead and explore the world around him. But, the camera never leaves Saul’s side. In fact, it’s set firmly on his face for the majority of the movie. And what a face! Géza Röhrig may well have just been cast for his fascinating and deeply sorrowful features, but his performance, as a whole, is excellent. And it had to be; with only a select few lines of dialogue, much of his performance is purely expressive and he does a brilliant job. Nemes also opts for a 1.37:1 Academy aspect ratio (a squarer image, similar to old TVs). Add that to the tight framing on Röhrig, and we’re left with a large portion of the ‘action’ relegated to the soft focus backgrounds. It really is a technical marvel. The blocking and the lighting (much of it seemingly fire-lit) are exceptional and the 35mm aesthetic fits perfectly. This is a deeply troubling film, and Nemes has managed to capture the horror of the Holocaust as well as any film in recent memory. The riot scenes towards the finale are particularly terrifying, especially with the addition of Tamás Zányi’s chilling sound design. 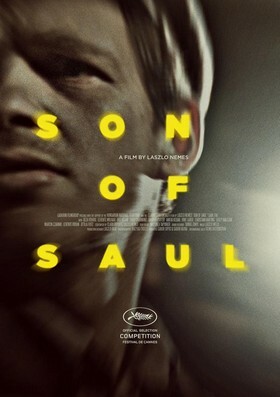 Son of Saul is absolutely fearless filmmaking from everyone involved. I didn’t catch Dheepan, but it sure has a lot to live up to . . .